Can you imagine living underground for six months, never coming above ground to see daylight or breathe fresh air? Entrance to the underground city of Derinjuyu. During a prolonged period of invasions, takeovers, and different civilizations inhabiting the Cappadocia region of Turkey, perhaps starting as early as the 8th century B.C., the people sought respite from their enemies by building massive living complexes beneath the surface. As various marauding armies traversed the area in search of captives and plunder, the Indo-European people who inhabited Cappadocia kept digging lower underground and expanding these troglodyte cave-cities. 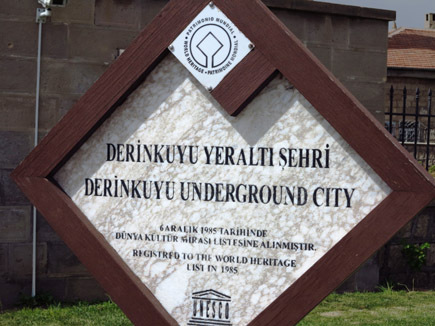 Derinkuyu (which means "deep well") is the deepest of the 36 underground cities in Cappadocia. This defensive hideout extends downward for four stories and has 53 airshafts carved at least 300 feet into rock formations left by ancient volcanic eruptions. Amazingly, the original ventilation system still functions, enabling visitors to go underground and marvel at what the early Turks had accomplished. 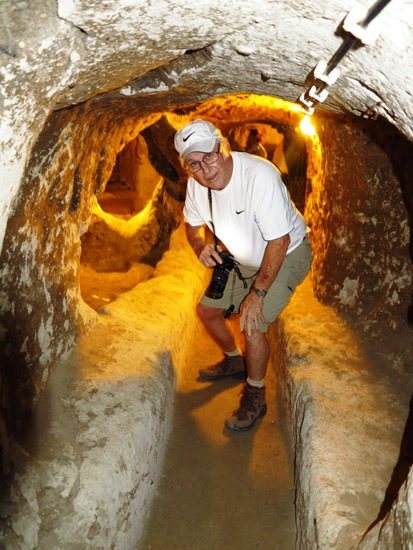 The underground city includes churches, stables, wineries, and storage rooms and was capable of safely housing 10,000 people for many months. of Turkey. Volcanic ash was easy to carve into liveable spaces. Giant rock formations in this area are composed of volcanic ash, which is fairly soft and easily carved. Throughout Cappadocia, these weird formations, called fairy chimneys, have been carved into cave houses where people lived for centuries. In some areas, people still live in these primitive structures. 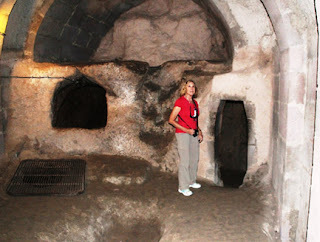 On our recent visit to Cappadocia we were able to tour the underground city of Derinkuyu. In ancient times, the first two floors under the surface housed a missionary school. Two long tables carved from rock and probably used for communal meals are still standing. We could see where the people had created a baptismal, kitchens, storehouses, living quarters, wine cellars, and stables for their livestock. Extensive networks of passages, stepped pits and inclined corridors link family rooms and communal spaces where people would meet, work and worship. specific functions for everyday living. The third and fourth floors consisted of tunnels, some created as dead-ends and others that simply went in circles to confuse any errant invaders. There were also secret places to hide and armories for their weapons. Water wells, hidden passages ways, a church and graves, and a confessional occupied the last floor. Approximately 600 doors lead into the underground city, all of them hidden in courtyards on the surface. Passages are mostly short and narrow; I even had to stoop over to walk through--and I'm short! In times of peace, the people did not live underground but used the spaces for storage of crops and stables for their horses. Whenever conflicts arose, which continued into the early 20th century when Cappadocian Greeks sought to escape persecution by the Ottomans, they could go and live there. As we explored the underground city, we learned that it is connected to other towns by tunnels that run for miles underground. When the Christian inhabitants of the region were expelled in 1923 the tunnels were abandoned but were rediscovered in 1963, after a resident of the area found a mysterious room behind a wall in his home. Further digging revealed access to the tunnel network. Although the temperature was mildly cool inside, our guide said that it was quite hot when she took an excursion to walk from Derinkuyu to another town via one of these tunnel. This large room was probably a communal area. 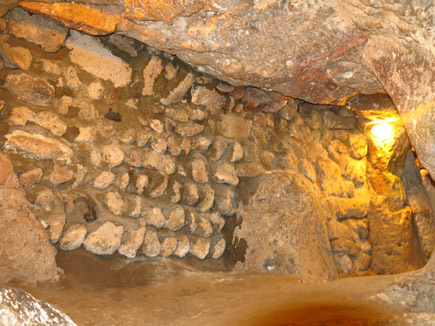 Since local citizens were used to living in cave houses, most were not very happy when the Turkish government began converting underground cities to museums in the 1960s. But we were grateful for improvements such as steps, lights, and signs during our tour. Seeing how ancient people created these cave cities--with primitive tools, no less--and imagining how they lived and worked there is experience you don't want to miss. I've been to that cave and it's pretty incredible. I would definitely get claustrophobic living down there, as you said it's hard to even walk upright in some parts. Wow. That is amazing and scary -- I would definitely get claustrophobic down there. This is the first time I've seen photos from here -- I mostly see photos of just the hot air balloons in Cappadocia. This is definitely something I would love to check out whenever I visit! I would love the chance to visit Cappadocia. These photos from the insides are so interesting. Its amazing how they made it. Great read! I just came back from Istanbul, but didn't have time to go to Cappadocia. I would have loved to visit the cave houses, but time was short. Well, maybe on my next trip to Turkey. Beautiful photos! Jennifer, we had a guide which was helpful in explaining what the different rooms were used for and providing a bit of history. We would have missed a lot exploring on our own (not sure if that's possible). What an extraordinary place! 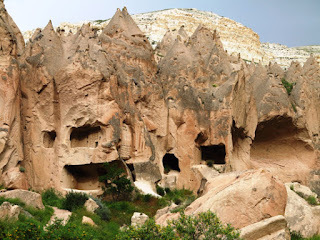 I'd heard of the caves a Cappadocia before but I've never really read so much about it until now. I honestly don't know I could live under there but it would be a great place to visit. Great post! I've heard great things about Cappadocia! I must take a visit at some point. Great post. I've heard lots of good things about Cappadocia. I must pay it a visit at some point! I've never been there but wish I could go now! The history behind it is terrifying. Love your opening paragraph. It enticed me from the beginning! What a great place to visit! Although, it may give me a little claustrophobia! If you're short and ducking in those tunnels, it might be a little too close for me! I couldn't imagine living there for such a long period of time!